In societies that trumpet individual rights, see everything as fleeting and see no value in sticking to something that's difficult, deciding to get married today takes courage, Pope Francis told young people in Assisi. "Don't be afraid of taking definitive steps, like that of marriage," the pope told thousands of young adults and teenagers who flocked to see him Oct. 4 in the square outside Assisi's Basilica of St. Mary of the Angels. As the pope's meeting-filled day in Assisi turned to evening, he arrived at the basilica and went straight to a group of people with disabilities, taking his time to bless them, kiss them and be kissed by them. He also entered the basilica to visit the "Porziuncola," the tiny church first entrusted to St. Francis in the early 1200s; when St. Francis heard God tell him to rebuild the church, he first thought he meant the little chapel. When the pope went back outside to begin his meeting with the youths, some of them asked questions about marriage, about discerning a vocation, about evangelization and about making the world more just. Although Pope Francis already had been in Assisi 10 hours and had celebrated Mass and given five speeches, he energetically ad-libbed and had the crowd roaring with laughter when he told the story of a woman who said her son was in his 30s, had a girlfriend, but wouldn't get married. "I told her, 'Ma'am, stop ironing his shirts,'" the pope said. But Pope Francis took the question about marriage and family life very seriously, telling the young people that Christian marriage is a "real vocation, just like priesthood and religious life are. Two Christians who marry each other have recognized in their love story the Lord's call, the vocation to form one flesh, one life from the two, male and female." "It takes courage to start a family," he said, and the modern world not only doesn't help, it seems to put obstacles in the way, "privileging individual rights rather than the family" and trying to convince everyone that relationships should last only as long as there are no difficulties. Pope Francis said his parents and the young people's grandparents and great-grandparents married in very different times. Economically, they faced many more challenges and even war, but they had the "certainty that the Lord was with them, that their family was blessed by God with the sacrament of matrimony and that their mission of bringing children into the world and raising them also was blessed." While God inscribed the vocation of marriage in human nature, the pope said, "celibacy or virginity for the kingdom of heaven" is a complementary vocation and "is the vocation Jesus himself lived." Priesthood and religious life do require giving up the possibility of marrying and having children, he said, "but virginity for the kingdom of God is not a 'no,' it's a 'yes,'" it is a total response to God's call. Pope Francis said the only way a person can hear God's voice and discern a vocation is by praying regularly. "Having this familiar relationship with the Lord is like keeping the window of our life open so that he can make his voice heard," he said. 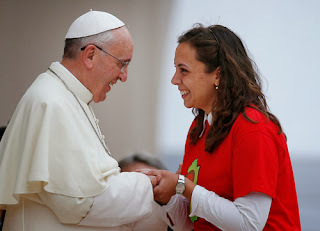 As for the Christian obligations to share the good news of salvation with others and to work for more just and peaceful societies, Pope Francis told the young people that the two go together. 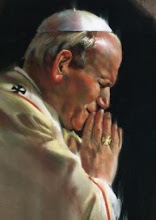 "The Gospel, dear friends, doesn't have to do only with religion, but with the human person, the whole person, and with the world, society and human civilization," he said. The Gospel tells people that they need salvation, which is something anyone should be able to see just by looking around them. Sin and the power of evil are at work in individual lives and on a much larger scale, he said. "But evil is not invincible, and the Christian does not surrender in the face of evil," he said. "God is greater than evil. God is infinite love, mercy without limits, and this love vanquished evil at its roots in the death and resurrection of Christ." The Christian mission has only one focus: to change individual's lives so they change the world, Pope Francis said. "Look at St. Francis; he did both things with the strength of the one Gospel. Francis made the faith grow and renewed the church; at the same time, he renewed society, making it more fraternal, but always with the Gospel," the pope said. Evangelize and work for justice, the pope told the young people: "Carrying the Gospel with the witness of our lives transforms the world."